As a tradition, birthstones have been used for centuries; the earliest application of associating a specific stone for each month comes from fifteenth century Poland. It was believed that the powers of a gemstone were heightened during its month, and so a person whould wear that particular gemstone at its peak to recieve the benefits of its power. This is unlike our modern tradition, which designates a stone for the people born of a specific month. While differing lists circulate regarding the stones associated with each month, Tiffany & Co published an anonymous poem in 1870 specifically listing all of the birthstones. That poem can be found here. Since this poem has been published, some birthstones have changed, but most are still accepted in modern usage. According to our modern tradition, aquamarine is the birthstone for March. Aquamarine is a blue variety of the stone known as beryl. Interestingly, this relates it to emerald, which is a green variety of beryl. Aquamarine can vary in hues from a rich sea blue to a more green or beige tone. While some aquamarine is opaque, most gemstone quality is clear with few inclusions. Aquamarine has been found in the United States, Brazil, and Kenya, among other places. Like many other stones, aquamarine is attributed with various metaphysical powers. According to Mary Lambert’s book Crystal Energy, Aquamarine was carried by sailors to protect them while at sea and to prevent drownings. Because aquamarine is associated with water’s purifying qualities, it’s understood to be useful both in cases of physical and mental healing. Ancient users believed aquamarine to help the eyes and throat. It is also used to promote courage, intellect, and spiritual awareness. No matter your reason for using aquamarine in a project, it is a truly a beautiful stone. We currently have a wide selection in stock, ranging from clearer nuggets to deep blue faceted rounds. Choose from individual pieces or strands- and if you choose a strand, enjoy 25% off while our stone strands are still on sale! So “March Babies” feel free to celebrate the month of your birth with a beautiful stone! Stone Stand Sale- 25% off! With a new month comes a new sale. 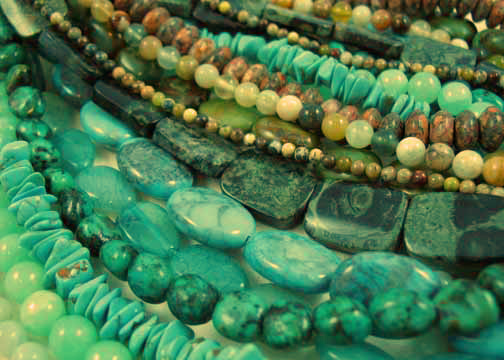 Starting today, all stone strands are 25% off! This incredible discount includes freshwater pearls and the prized strands from our case. With some strands as low as $4.99, this is a discount not to be missed! So let your inspiration flow unchecked as you take advantage of our sale. We hope to see you soon! To compliment these we have also received a shipment of German silver beads, a new metal to our store. German silver is 30% silver and 70% copper. The formula of this alloy delays the tarnishing process, and it is an alloy, not a plating. This means that it’s the same mixture of silver throughout the entire piece, rather than a plated layer that can wear off. The German silver comes in a variety of styles, from brushed silver textures to a Bali-like detailing. Photos will be posted soon, so check back to see what is causing the excited buzz! Each month, a variety of beading classes are taught by the Bead Bazaar staff; many of these establish the beginning techniques that act as building blocks in future beading projects. Most classes are repeated every month, and more info about them can be found here. This March, we are excited to feature the work of guest teacher Connie Case. As the 1st place winner of our second annual beading contest, Connie Case is a local artist whose quilted rendition of her daughter’s self portrait captured the hearts of many. With the spirit of her whimsical style in mind, Connie will be offering a workshop on Rustic Art Quilting. This project focuses on a pleasing aesthetic of varying textures, relaxed details, and rustic stitching. Rather than creating precise perfection, Rustic Quilting celebrates a care-free, home-made feel and appearance. This class will be offered at the Bead Bazaar as a two-part workshop on Saturday, March 13th from 1-3PM and Saturday March 27th from 1-3 PM. If you’re interested in this workshop, make sure to come in and register at the Bead Bazaar by March 11th. The cost is $60, which includes the fabric, batting, needles, and initial floss for the first class. For the second half of the workshop, you will need to provide beads, additional floss, and some small scissors. Ideal class size is 4-8 students. We hope to be seeing you soon!